The Campaign for Sustainable Transportation is open to considering a variety of forms of transit that may be appropriate for the corridor. On this page are two articles on automated transit. Brett Garrett describes Personal Rapid Transit, and Dana Bagshaw describes development on an automated transit system using a 20-passenger vehicle. Personal Rapid Transit (PRT) consists of an elevated guideway with small electric podcars providing non-stop, automated, on-demand service from any station to any other station. Depending on the podcar technology, the guideway could be lightweight monorail, a concrete path, or tracks resembling a roller coaster. 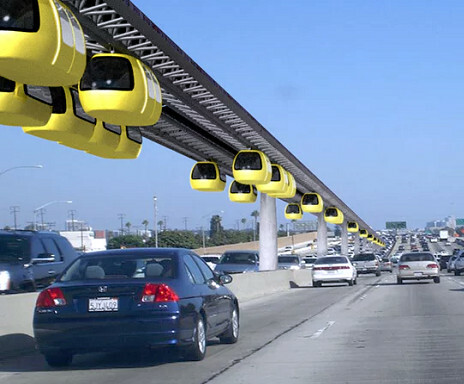 PRT could be installed along any corridor such as Soquel Avenue, Highway 1, or the rail corridor. The PRT system can provide direct access to UCSC, Cabrillo College, and hospitals while including loops to serve large areas of Watsonville and Santa Cruz. The PRT guideway is elevated, completely separate from pedestrians, bicycles, and automobile traffic. This separation provides profound benefits for improved safety and reduced congestion. PRT would allow for a wide trail along the rail corridor. The PRT podcars are very lightweight and therefore extremely efficient compared to a train, bus, or conventional monorail. Furthermore, the system can be completely powered by solar panels along the guideway (along with batteries and/or grid). The operating cost of PRT is extremely low. The established PRT system in Morgantown has a 50-cent fare which pays more than half of its operating expenses, even while providing free service to West Virginia University students. PRT is a high-capacity system. One guideway with a podcar every few seconds could easily serve more people than a freeway lane, and profoundly more than an hourly bus or train. PRT has aesthetic benefits including the possibility to move power lines into the PRT guideway, and reduced need for automobiles. Just imagine a new affordable housing development built with a PRT stop instead of a parking lot. The podcar size can be anywhere from two passengers (skyTran) to around twenty passengers (CyberTran), or somewhere in between (Spartan Superway). Some systems allow different podcar sizes within the same system. Larger podcars are also known as Group Rapid Transit (GRT). In conclusion, PRT has many benefits and we advocate that the Regional Transportation Commission should formally study PRT to serve Watsonville to Santa Cruz. In particular, PRT should be considered as an alternative to highway widening. Over the phone, Dexter Vizinau speaks gently, but with passion. He has been champion of a new transit technology since 2008. Now President of CyberTran International (CTI) based in Richmond, CA, he and his colleagues are working to commercialize the new technology. 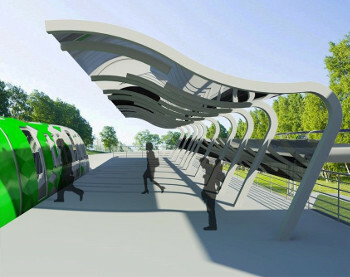 CyberTran is an ultra light rail that floats on elevated guideways, powered by solar energy directly supplied from canopy panels. Compared to Personal Rapid Transit (PRT), CyberTran would be a full-scale public transit system. Its ADA-compliant pods carry up to 20 passengers with 9-second headways (time between dispatches) and capacity that would match BART at rush hour. The automated pods would be driverless. But since the system is elevated above traffic and intersections, they would be removed from collisions and pedestrian run-ins. CTI plans to launch building systems in three locations this year, one of them in Davis. The Davis project will go from ground breaking to demonstration in two years. Its test tracks will run at 60 MPH, and include a 10% grade which, according to Vizinau, could handle Altamont Pass, or Highway 17. CTI is currently financed through a combination of private and public funds. The federal government has approved a program of funding that offers a 80% match for 20% state, local, or private funds. One of the goals of the program is to support federal R&D projects, and since the CyberTran prototype was developed by Dr. John Dearien, a senior engineer with the United States Department of Energy (DOE), it is a strong contender for the funding. But CTI has other financial plans as well. Another licensing example might be for the system control user interface, which passengers will use to book rides and purchase tickets, whether with their smart phones or at a station kiosk. Passengers can be taken directly to their destination, and pay extra for a private car if desired. All Cybertran International pods would be manufactured in the United States. Vizinau envisions manufacturing at three ports in the USA, shipping out to other interested countries like China, India, and Brazil, as well as African nations. “Our technology is real, its engineering solid. In 2011 we applied for ten patents, and 8 of them have been issued so far.” The patents cover not only the pod vehicle, but the infrastructure that supports them, including the control system operations. With the increasing threat of sea-level risings and storm surges, CyberTran seems a smart investment, especially along the Coastal Trail.